This interesting game from Scientific Gaming brings together the best of both worlds between classic table games and modern slots. So, you get all the classic roulette play and can use all your regular strategies in that, but you also get a bonus game just like you would if you were playing a slot machine, like Monopoly. Monopoly is a constant source of inspiration for the development team at SG Interactive. They’ve produces dozens of casino items themed on the well-known board game and one of them is Monopoly Roulette Tycoon. In essence, it is a standard roulette game, but there is a twist. The game provides a special experience by adding a slot-like bonus to a traditional European roulette layout. So, it’s safe to say that Monopoly Roulette Tycoon is a good choice for online gamers who take pleasure in roulette gameplay and are fond of the classic family game and its power to make one become a property tycoon - we can definitely see the attraction in that. For those unfamiliar with how roulette works, it is a simple game of predicting what number will be spun on the roulette wheel. A little white ball is tossed as the wheel starts to spin, and the number where the ball lands is the winning denomination. The wheel is divided into 37 equally sized pockets, half of them are painted black and half are red, numbered from 1 to 36, with a single exception - one green 0 pocket. The game of roulette allows the player to choose from an assortment of bets, and most of them don’t require a prefect prediction about which number will be spun. The list of bets includes popular inside bets and outside bets, as well as the so-called French bets, namely Voisins, Tiers and Orphelins. The stakers can choose among Straight, Split, Street, Corner, Six Line, Any Dozen, Any Column, 1-18 or 19-36 (Low or High), Odd or Even and Red or Black. There is a special Monopoly Board button underneath the roulette wheel. Bu clicking on it, the roulette betting table is replaced by the Monopoly Property Strip. There, the player can make side bets on Monopoly and choose among the available real estates. To activate the Monopoly Bonus, the player is required to land the ball in a red pocket within 4 rounds. Your property value will rise depending on the bonus being triggered on the first, second, third or fourth spin (properties are valued at 1x, 2x, 3x, or 5x respectively). 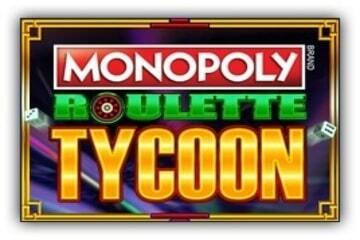 What More is There to Know About Monopoly Roulette Tycoon? When the bonus side-game gets activated, the player is awarded with three rolls of the dice and Mr Monopoly appears, ready to run across the board. The goal is to have Mr. Monopoly land on the property you’ve placed a bet on, or at least have him stop on Go, or pass Go, because in that case you’ll get additional dice rolls and the property value will rise. Landing on the fields such as Chance or Community Chest will award players with corresponding cards. Get Out Of Jail Free card equals to a cash prize, whereas the Go to Jail or Property Tax cards end the round. You can also move forwards or backwards, which comes as no surprise to anyone who has ever played Monopoly, the original tabletop game. The idea of Monopoly Roulette Tycoon is a concept so easy to fall in love with because it offers two games in one, basically. You can place money on the roulette wheel and experience the thrill of classic casino and enjoy the board game element of fun and suspense at the same time. Monopoly bets aren’t affected by the base game roulette bets and payouts, and therefore the house edge is at 2.70%, just like with any European roulette game you’ll find online. The developers have made the game available in instant play, so that both mobile users and desktop gamers can access it easily without downloading any software packs or apps.